The Buzzed Assassin is back again. Now, where did the Assassin get to this time? Well, friends, the truth of the matter is that I cannot tell you the whole truth. But I will say this: from time to time, even the best of us must take a moment to return to basics, to refocus our energies and to go through the training necessary to keep our livers in fine, liquor-processing shape. A well trained Assassin is an effective Assassin, one willing and able to take on the burden of filtering the bad Bloodys from the good. Now, with that refocusing and retraining time past, the Assassin once again goes forth, ready to strike down cocktails at a moment's notice. For my return to the Tomato and her tomato, horseradish and vodka scene, I decided to brunch with a few friends at a location I had been meaning to try for a while: Plein Sud. Since June 2010, Plein Sud has been ensconced in the ground floor of the Smyth Tribeca, adding a French brasserie dining option for guests of the Thompson Hotels’ Tribeca location and for those who happen to walk by the intersection of Chambers and West Broadway. Possessing a farm-like rustic decor, the restaurant seemed bright and inviting when we first arrived, and the cheery staff seconded that feeling. After being seated, the Assassin and his party were able to quickly peruse the brunch offerings, which ranged from standards (such as the steak and eggs variant that the Assassin ordered) to some not so standards (such as the Decadent Pancakes, which the Assassin will get to momentarily). We made note of our food orders and proceeded to the cocktails. I quickly noted the presence of a Bloody Mary, a Bull Shot and a Bloody Bull. 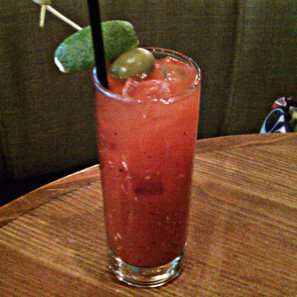 The Bloody Bull, for those not in the know, is like the child of a Bloody Mary and Bull Shot. Beef bouillon is derived from its Shot father, offering an extra savory ingredient to the tomato juice of its Mary mother. The vodka and spicy ingredients, such as pepper or horseradish, are common to both and therefore round out the flavors of a Bloody Bull. For those who would like to experience such a drink, take a look at the Assassin's review of the Bloody Bull at Five Points. But for this review, the Assassin decided to go with the classic Bloody Mary. After a few minutes, my Mary arrived, and she was a rather classic beauty. With visible pieces of horseradish, flecks of pepper in a nice, red bloom of tomato juice and a simple lime and olive garnish held in place by a bamboo pick, this Bloody certainly looked the part. But would she taste similarly? A first taste showed the Assassin that the tomato juice, while good, was a bit flat and not as full as he had hoped. The horseradish and pepper both added a nice spicy kick without being overpowering, and the balance of the cocktail was good, not allowing the vodka, the spice or the tomato to take over the palate. Overall, this made for a good, but not overly impressive, introduction to the Assassin’s brunch experience. Now about those Decadent Pancakes: if you are the type of person who enjoys a sweet brunch dish, like one of the Assassin's brunch mates this day, you can certainly not go wrong with this dish. Three pancakes, Nutella, Chantilly cream and maple syrup made for a very cake like experience when the Assassin tried one bite. While he could see the appeal, it is not his brunch taste, and certainly not with a savory cocktail. The Assassin instead opted for a good, but not great, steak accompanied by some well-made, fluffy eggs, hash brown style home fries and a nice side salad. For a perfectly acceptable Bloody Mary experience to go with a perfectly acceptable brunch, the Buzzed Assassin gives Plein Sud 3 Celery Stalks. Plein Sud 85 West Broadway, New York, New York 10007. T: (212) 204-5555.